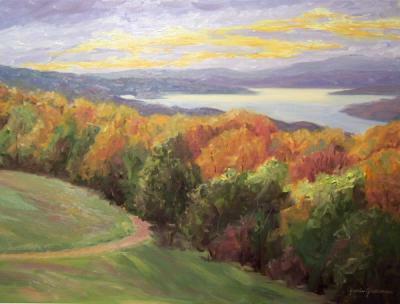 I used a smaller, plein air version of this scene as a field study to paint this larger work inside the studio. This painting is still wet, and since it’s too large to fit in my light filtering box, there’s some glare on the image. I’ll try to get a better photo of the painting before it goes off to its new home! This painting was a long term project. 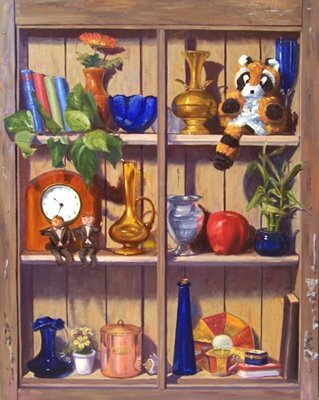 It is on gallery wrapped canvas, with the sides painted to look like part of the shelf, so it does not require a frame. When the canvas hangs on a wall, it will look like a wall shelf mounted on the wall, though I think it would look fabulous with a rustic frame that looks like part of the shelf! $250.00 plus $10 shipping and insurance within the Continental United States. For local sales, shipping charge will be allocated to NYS Sales Tax. Please email me at JamieWG@aol.com for International purchases or with any questions. 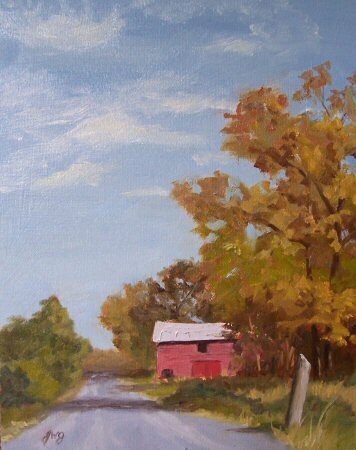 This was painted from a photo I took in New Paltz, New York. I love the vistas there by the Shwangunk cliffs, with rolling farmland and old barns everywhere.